The wind sighs through the cedars in the Ozark hills, stirring branches in the trees. A persistent high pitched tap echoes through the area… tink, tink, tink. A few voices are heard here and there, but other than the sound of sheep and the occasional bark of a dog, there’s little else. Just over that rise, there are people working, people in trimmed shirts, hand-constructed leather shoes and hats. 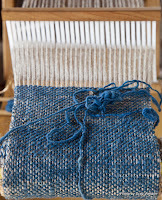 A rope-maker shows young boys how to weave fibers together to form yarn that’s then woven together into a stronger length of rope. The potter works the clay for mugs and bowls. 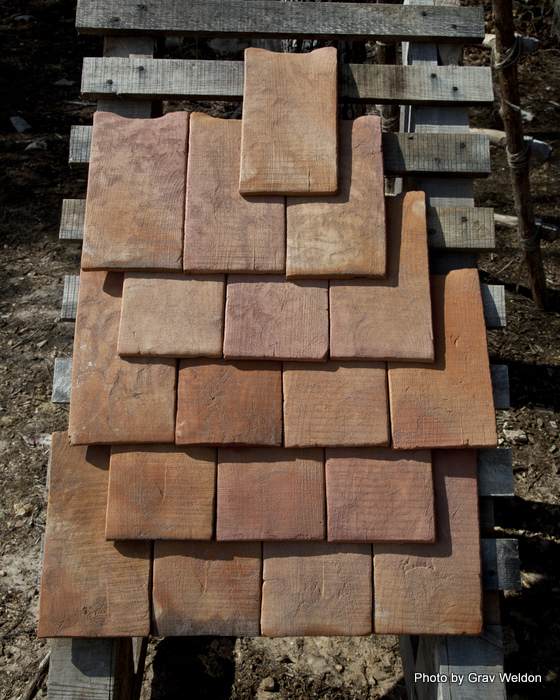 The softer sound of chisel on wood can be heard coming from a shelter, where the carpenter is working. There’s a hiss down below, where the blacksmith has just dropped a horseshoe into water. And in the center of it all, on a cleared and slightly muddy hillside, a wall. But more than a wall -- a series of walls and circular stone constructions about shoulder high. 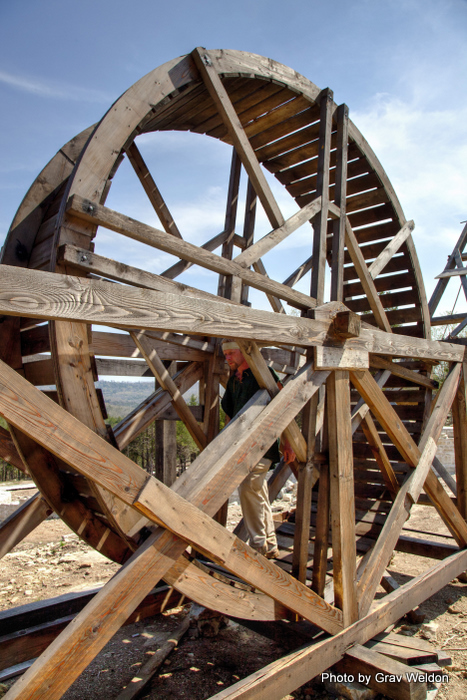 In the center, a giant wheel with an arm. There’s a well here, too. And if you let your imagination fly, you can dream of these walls growing to 25 feet in height, with towers soaring up to 45 feet and a Lord’s Tower that will reach 70 feet. You can just see where the drawbridge will be lowered, where ladies and lords will one day pass on a terraced green within. 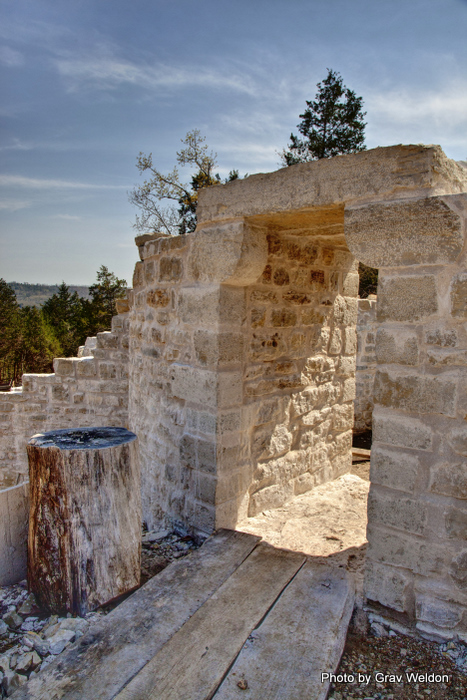 But for now, there’s the constant buzz of activity as masons set stones carved on-site by hand, slowly but surely assembling a French fortress in the Ozarks. But this isn’t the Middle Ages. Though the bastion on the side of the hill is being constructed from stone milled on site by laborers working by hand, it’s a product of the 21st Century, not the 13th. 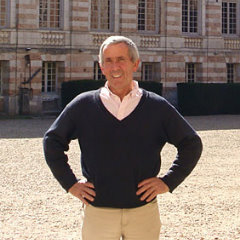 It’s the brainchild of French entrepreneur Michel Guyot. He’s been involved with other fantastical projects, including the restoration of a number of castle ruins throughout France and the construction of a medieval-esque castle called Guédelon in Burgundy. 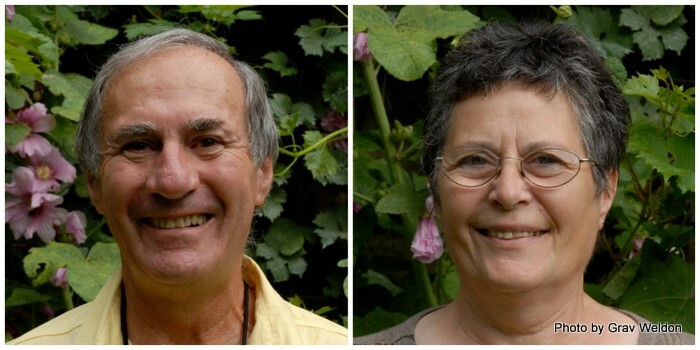 Marc and Solange Mirat, two French citizens who have lived in the Harrison area for over two decades, visited Puisaye in September 2008 and were mightly impressed with Guédelon. They offered to sell land they owned in Lead Hill to Guyot for the purposes of building this citadel on American soil. 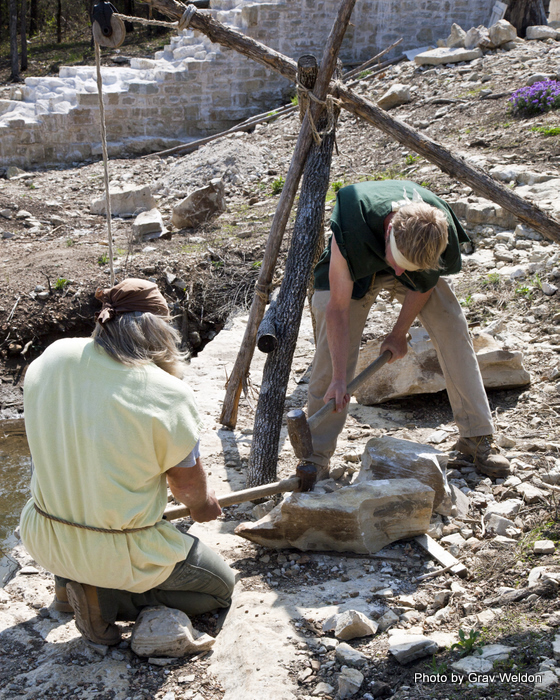 In June 2009 ground was broken, and today the project of building the Ozark Medieval Fortress is well underway. Underway is the correct term; it takes a bit of a dreamer to be able to visualize what the fortress will look like in 20 years. But those plans are right there when you enter the park. I traveled to Lead Hill this April to visit the new wonder rising in the area, expecting to find an architectural project underway. 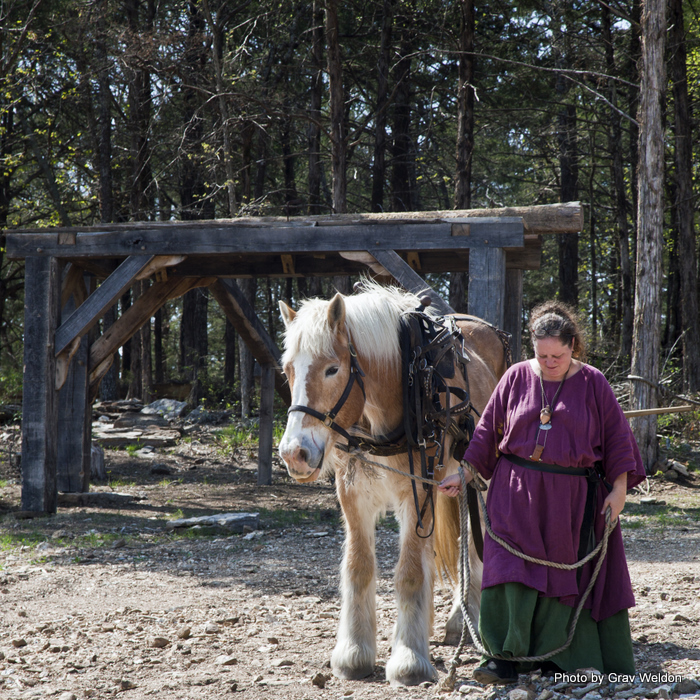 What I truly discovered was a fledgling community out to tackle an impossible task, teaching others about life in the Middle Ages at the same time. The first person most people meet along the way is Medieval James. I asked him for his full name, and he insisted he’s just Medieval James. James is the historian at the Ozark Medieval Fortress. He knows everything there is to know about the structure being built and the time it represents. “For the purposes of the fortress, it’s the year 1226. 1226 is the first year of the reign of King Louis IX of France, who later became ‘Saint Louis‘ and the namesake of the city of St. Louis. It is the middle of the High Middle Ages, a century before the Black Plague. James gives his talk in a small house just past the visitors center, giving each crowd a good idea of what the castle is and will be. There are diagrams on the wall, three of them -- one showing how the foundation of the fortress was set out in 2010, one of how it should look in 2020 and a third showing near completion in 2030. It’s a long ranging project that will see a polygon plan rise along the hillside. 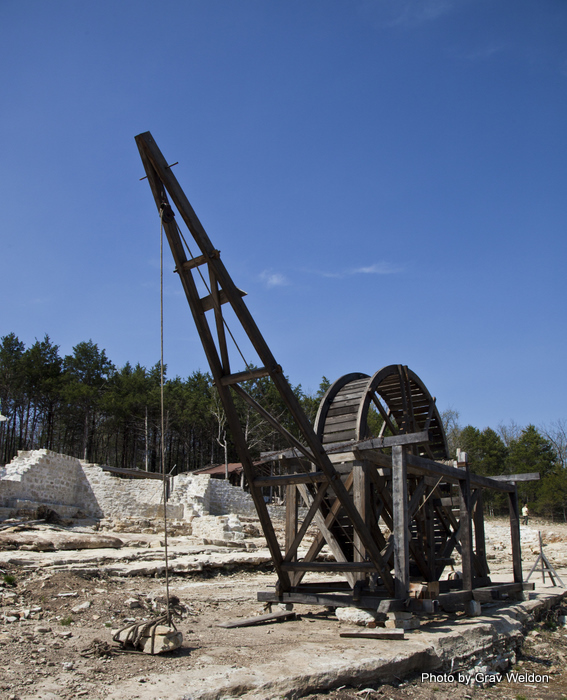 James started the tour down a path made from crushed limestone, a by-product of the stone carving process. If the castle had been built in France, it would have been made from locally available stone. 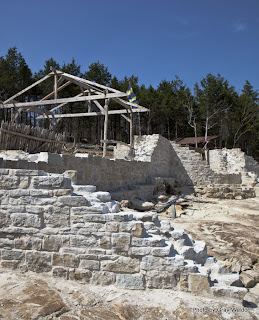 Because the fortress is being built in the Ozarks, it’s being constructed from site-quarried Arkansas magnesium-laden limestone. “It’s hard to chisel,” James says, “but it will last millennia.” Since the path needed to be gritted to make it ADA accessible, using the dust and debris from the stonecutting operation was the logical choice. The stonemasons are experts in their craft, using the quarry there to cut the precise stones needed for the outside of the walls, the carved stones that will decorate the inside and the broken stones that are used as fill between the outsides of the five-foot thick walls. They’ll progress a bit further each year. At the end of last season, they sealed the top of the walls as they were with a wet concrete solution. That layer is chipped away and construction has been started afresh on this year’s progress. 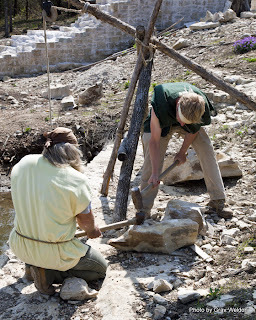 It’s not just the stonemasons that have their work cut out for them, cutting and carving and hauling up the rocks that will build the castle. The potter has a real challenge -- creating a workable tile from Arkansas red mud and then creating the 12,000 tiles over six years to cover the roofs on the towers and abodes within. James takes us past the construction of a paper factory house and past picnic tables set up for visitors down to a model of a wooden fortress, a starting point for the tour. There he explains the difference between a castle and a fortress. “The fortress in the early Middle Ages was purely for protection. No one lived there. 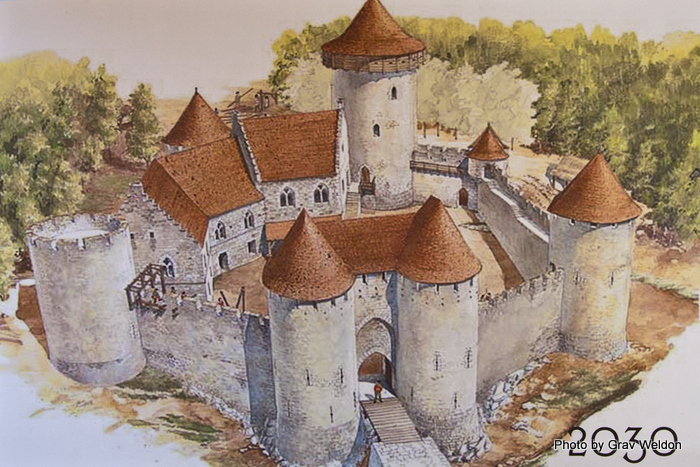 The wooden fortresses were built first to protect people before the castle was finished. See, when the Roman Empire fell everything went into chaos. You had the barbarians -- barbarian meant ‘bearded one,’ in the first years. Infidels in the 700s. In the 900s you had the Vikings from the north. You needed to be fortified against these invaders. He took us from the model into a wooden fortress built right on-site, a demonstration of what would have been built before the castle itself. The wooden sections of fence were pulled tight together, just tight enough you could see through the planks to see who was coming. We progressed down the path to the first workshop, where sheep grazed in a pen on the right side of the path and a shelter was set up on the left. This is where we met Catherine Koehler, one of the many resident artists who work at the Ozark Medieval Fortress. 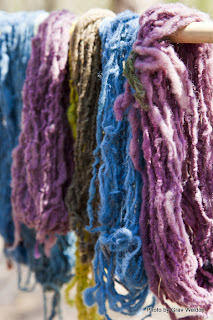 Catherine is an expert in fiber arts and medieval illumination who‘s moved here from Mississippi. She, like Medieval James, has studied extensively in her field. 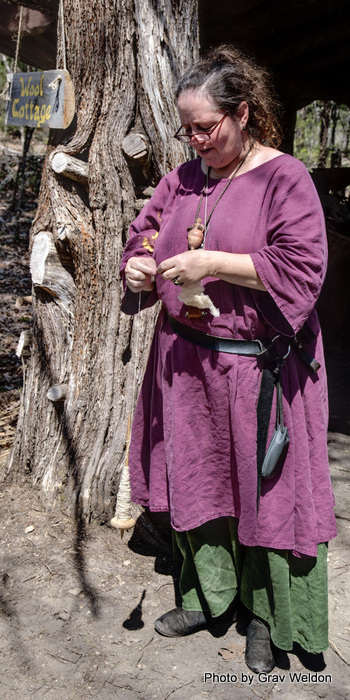 Her undergraduate work at the Memphis College of Arts paired with her longtime experience as a medieval re-enactor with the Society for Creative Anachronism have well prepared her for this sort of work. “Is it hot?” one of the visitors asked. “It was cooler back then, wasn’t it?” my photographer asked. 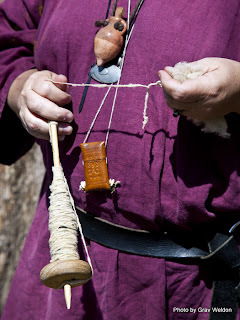 She showed us how to use a drop spindle to make thread and talked about how felt was made. Catherine also shared with us later about the sheep. 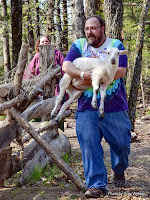 The day we came by two new baby sheep were introduced to the flock, and as we discovered they weren’t contained by the fences. 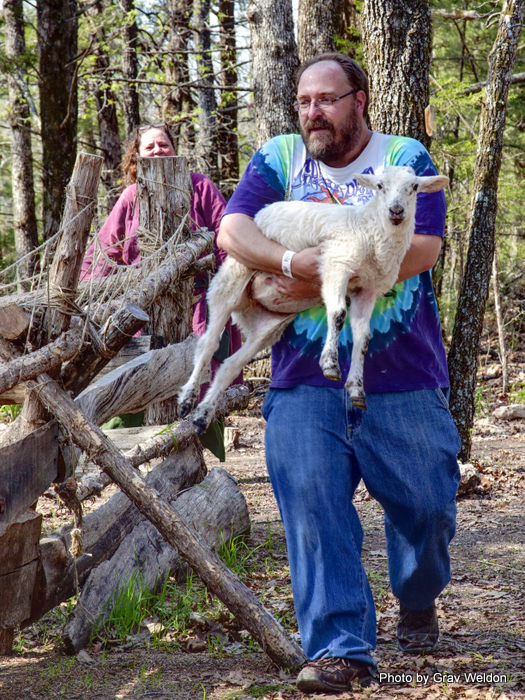 My photographer is apparently a good sheep catcher. I sat down with Catherine after work to talk about the project and asked her what it was like to work on the site. Catherine does all sorts of demonstrations, not just for the tours but for individuals who come back through to learn a specific skill, like a little looming or some medieval-style calligraphy or illumination. Every day she’s out there in her layered dresses, another cog in the wheel of life at the fortress. James took us along a three quarters of a mile path, stopping at stations along the way. He pointed out brush piles left to draw animals for hunting and a raised bed garden. 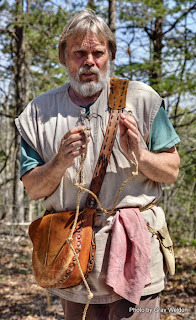 He showed us how medieval carpenters used a 13-knot rope to construct buildings and take measurements. He took us past the quarry where stones for the castle are chipped away. And then, right past the stable, we looked out from under a canopy of trees and saw the vast white construction ahead of us. 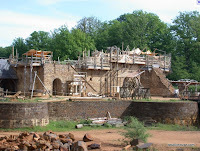 This is what you see today, a castle in the making. The stone walls have been constructed to anywhere from four to eight feet high in the past year on a long inclined slope. 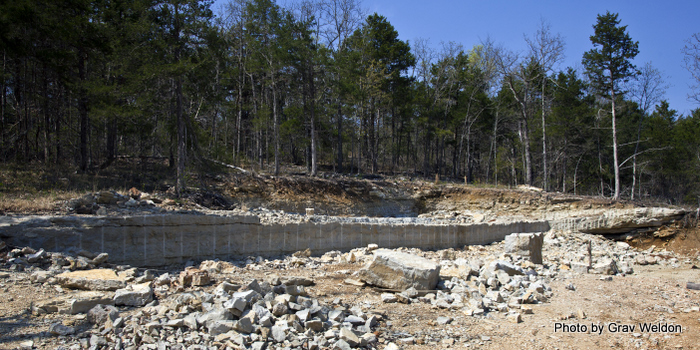 You can see where the surface has been taken down to the rock -- the unique Ozark limestone bedrock meant there was no need for a foundation to be dug out of the dirt. 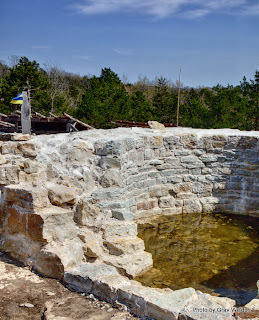 There’s also a well already there, created from the spring at the center of the castle. 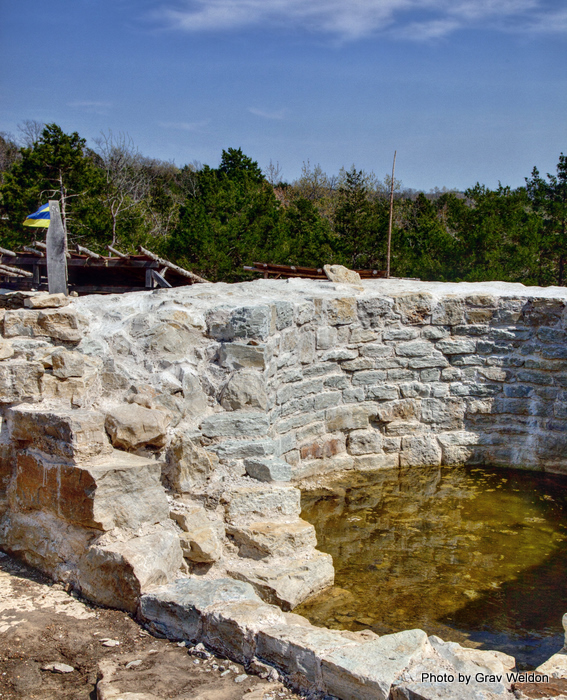 As it would have in medieval times, it will provide water to the castle once it is built. I think I was expecting something a little smaller, more like a mansion or large house. But the enclosure is immense -- wider than a football field and fully half as long, more in some places. The rains over the winter have filled the base of the two gate towers. It’s a climb from the bottom of the hill up through the future courtyard to the round bases of the towers and the larger Lord’s Tower that will one day reach 70 feet into the Ozark sky. The work is already evident -- such as the meticulously carved stones over doorways and the sills of the archer’s slits. The basis of the staircases that will carry people up to higher levels in the towers and the abode that will be constructed there are still being built up. At this point, little is off-limits. The masons pack up for the day around 1 p.m. and the guides prohibit walking on top of the bare walls. But that’s about it. They suggest you don’t fall in the well. 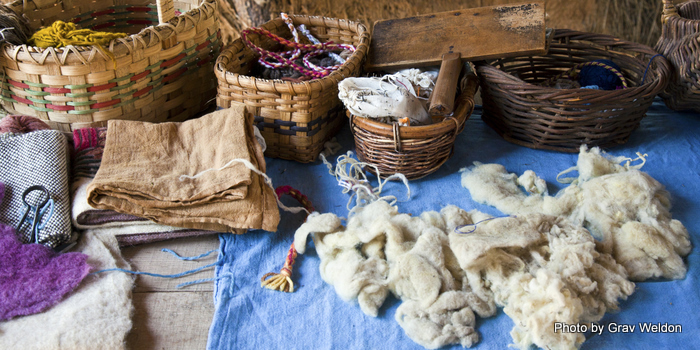 All around the castle are shelters, lean-tos and stands where artisans work and share with visitors. There’s a massive oven downhill for cooking crusty loaves of bread. 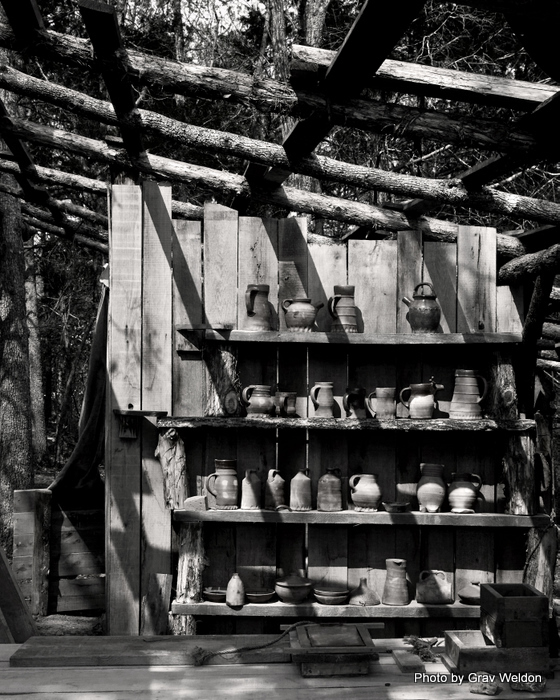 The blacksmith’s shop is full of iron pieces and lengths of metal, horseshoes and primitive tools recently forged. There’s a basket weaver, and up the hill you’ll find the potter, if not working at the wheel then tending to the firing of an earthen kiln. There’s a rope-maker who shows how to weave fiber into strands into string and stronger ropes, a carpenter, a station where you can choose to illuminate your name or a favorite saying. 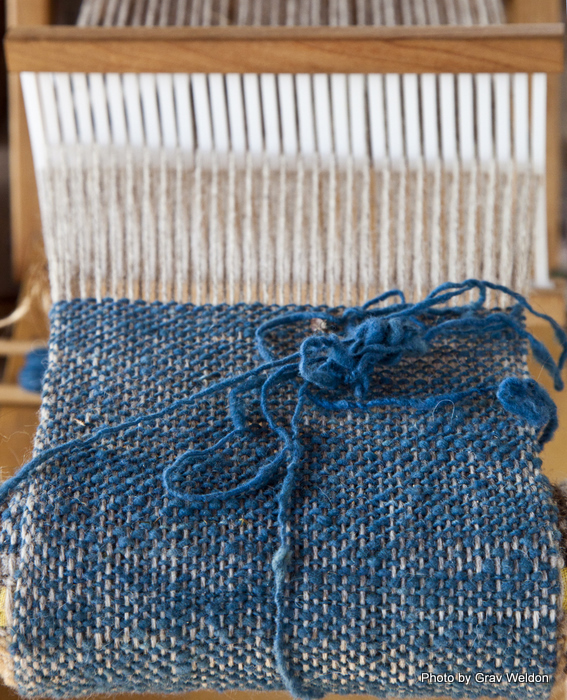 For a small fee you can weave your own wool bracelet or carve your own piece of stone. 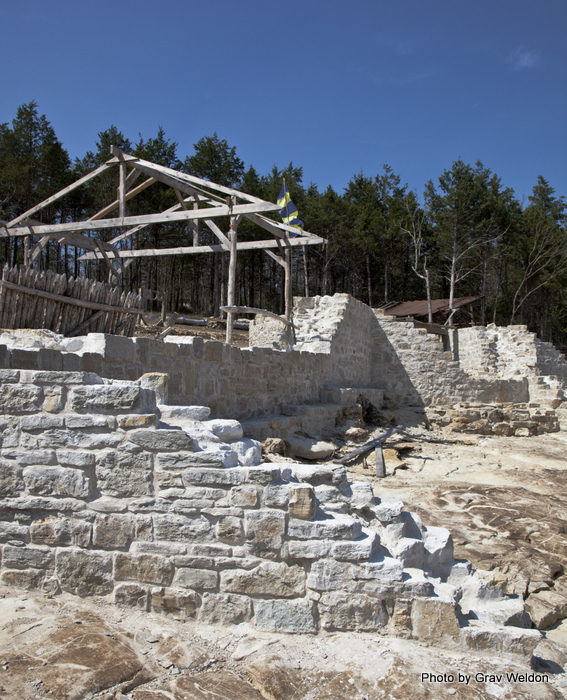 All the while artisans and volunteers work on the castle, on the tools to create the castle and what will decorate it in years to come, and on the basic needs like sustenance and clothing for this small community. 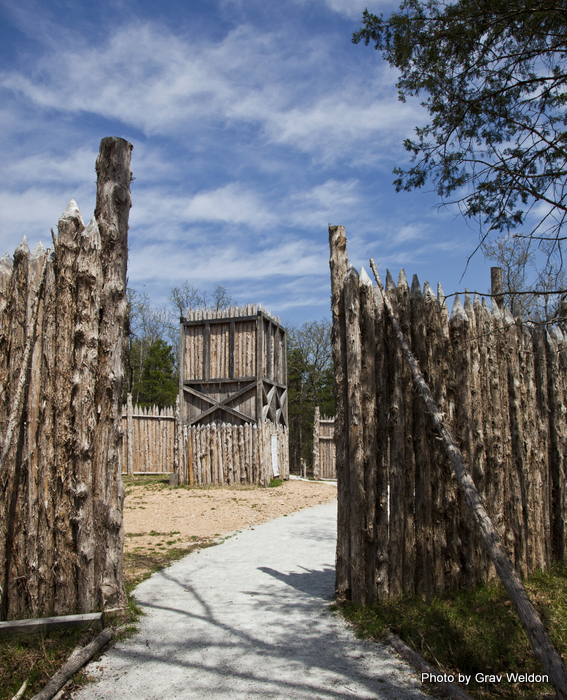 Will you see knights at the Ozark Medieval Fortress? James shares his views on the knights. It’s been just two years since ground was broken on the project, and already there have been visitors from as far away as Italy and Belize, Germany, Italy and Switzerland, Poland and Brazil. The castle has a growing popularity amongst locals here in Arkansas; during my travels I’ve heard from people who have raved over their visit and from others who are trying to fit a visit into their schedules. The flag marks the well's location. There is a small problem that the project faces though -- and that’s money. Because the owners are French, they can’t apply for the same sort of not-for-profit status that might help a similar effort created by Americans. They’re having to rely on the generosity of 14 investors, fees for those who come to the fortress and whatever else they can piece together. When you’re talking about a crew of several dozen artists in residence, administrative costs and advertising, that’s a lot of money to recoup. But everyone I spoke with at the Ozark Medieval Fortress has the highest hopes on its success. For them, failure is not only off the list of options, it’s an impossibility. I’m looking forward to visiting again and again to see the raising of this remarkable castle, to watch it grow and see who comes to observe its progress. Perhaps by the time my child is an adult she’ll be able to tell people how a group of artists and innovators grew a castle in the Ozark hills and merged Southern hospitality with the age of chivalry. 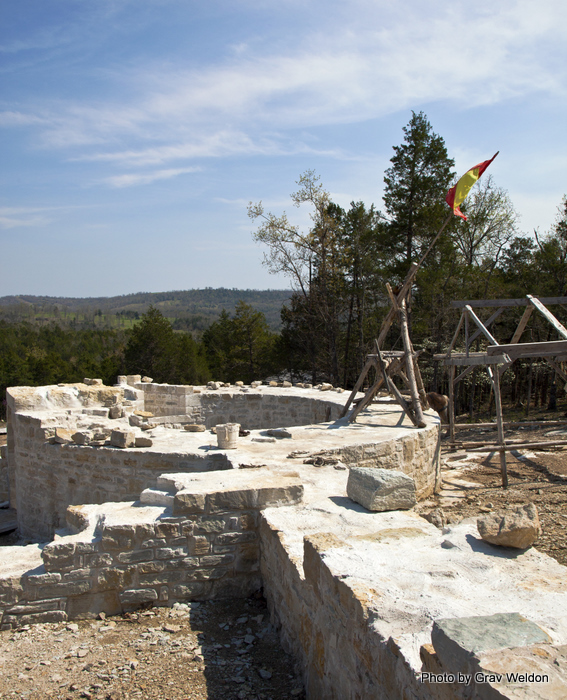 The Ozark Medieval Fortress is open 10 a.m.-6 p.m. Wednesday-Saturday and 1-6 p.m. Sunday. For a neat inside view on how the Castle is progressing and about the Middle Ages, check out the great blog Medieval James has put together. It's an excellent read. January 20, 2012. 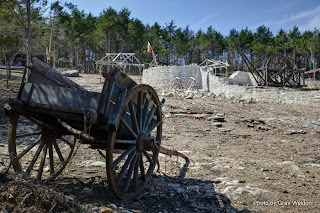 Sadly, the owners of the castle have decided not to reopen it for this season. They're looking for buyers to take over the project. I hope someone else steps in and continues this neat project. There's a lot of people depending on it for their jobs, and frankly it's just a really cool idea. I wonder why they are not allowed to plant madder? Is it perhaps a 'foreign' plant, or something like that? They often re-create the middle-ages theme there with fine imported stallions from horses for sale melbourne. I feel like a Fair Thee Maiden. I guess it wouldn't be a bad idea to learn some of these old ways - especially how to make horse shoes. All that time spent on centennial park horse riding lessons would be wasted if I didn't know how to take care of the animals. Does anyone know the current situation with this castle?? ?